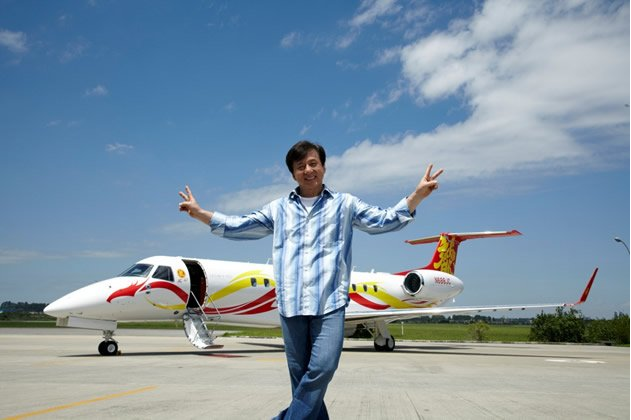 Brazilian jet maker Embraer has come up with a cunning plan to sell their planes to Chinese people: get Jackie Chan involved. 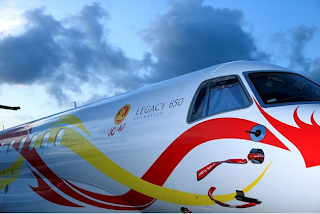 The popular kung fu star has become the ambassador for Embraer and now owns his own executive jet from the company, the Legacy 650. The aircraft is on display at the Singapore Airshow 2012, which will be open to the public on February 18-19. 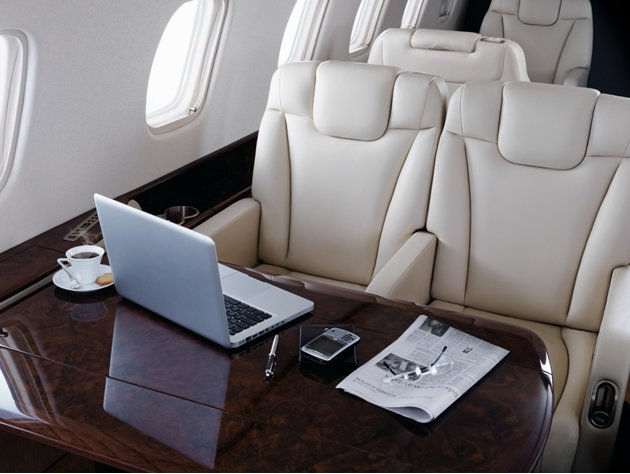 Chan said that he "chose" the US$30 million Legacy 650 because of its large, quiet cabins and its sense of luxury. Frederico Curado, the chairman of Embraer, hopes that Chan's endorsement will help familiarize Asians with the brand. 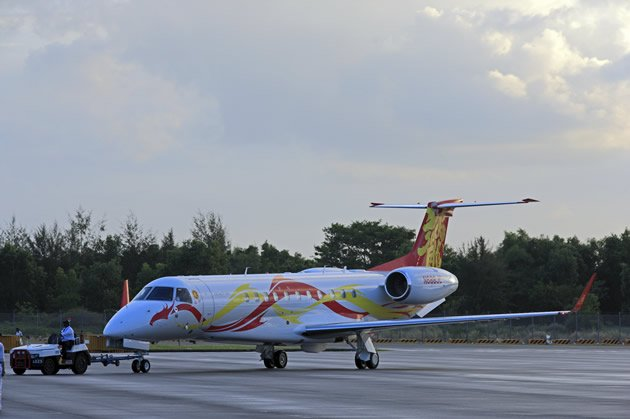 The magic of celebrity is already working for Embraer as the company has recently received 13 jet orders from Minsheng Financial Leasing, China's leading executive jet leasing company. From the outside, it would be hard to mistake the owner for anyone other than Jackie Chan. 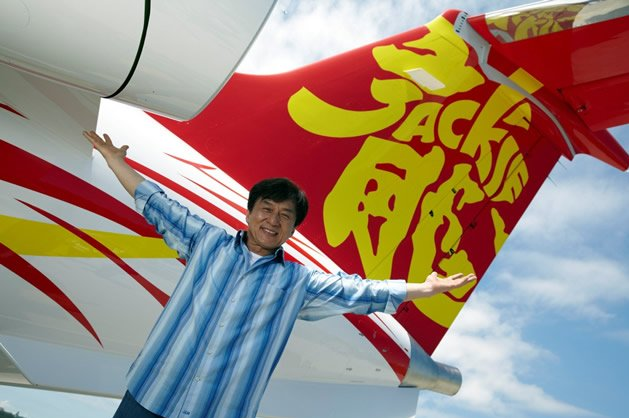 His name in English and Chinese is painted on the tail of the plane, while red and yellow dragons intertwine on the plane's body. From the inside, the Legacy 650 is divided into three distinct cabins, a wet galley and a huge baggage hold. With a maximum flying time of seven hours, or 3,900 nautical miles, Jackie Chan's Legacy 650 can take him and 13 other passengers from Beijing to Dubai without stopping. During his flight, Chan can pass the time playing Words with Friends using the on board Wi-Fi. Perhaps its time Alec Baldwin got his own jet too. Getting there: The Singapore Airshow is Asia's largest aerospace and defense show. It is currently being held at the Changi Exhibition Centre until February 19 and is open to the public only on February 18 and 19. The Embraer Legacy 650 is part of the static aircraft display. See www.singaporeairshow.com for details.